I think his content contains genuine wisdom. He challenges his audiences, leaving implementing the wisdom up to them. As it should be. There's no quick fix. No magic bullet. Tony can challenge us and motivate us, but we have to do the work. CHANGE - "I've continued to recognize the power individuals have to change virtually anything and everything in their lives in an instant. I've learned that the resources we need to turn our dreams into reality are within us, merely waiting for the day when we decide to wake up and claim our birthright." CHARACTER - "The only reason we really pursue goals is to cause ourselves to expand and grow. Achieving goals by themselves will never make us happy in the long term; it's who you become, as you overcome the obstacles necessary to achieve your goals, that can give you the deepest and most long-lasting sense of fulfillment." COMMITMENT - "I believe life is constantly testing us for our level of commitment, and life's greatest rewards are reserved for those who demonstrate a never-ending commitment to act until they achieve. This level of resolve can move mountains, but it must be constant and consistent. As simplistic as this may sound, it is still the common denominator separating those who live their dreams from those who live in regret." FOCUS - "Most people have no idea of the giant capacity we can immediately command when we focus all of our resources on mastering a single area of our lives." INITIATIVE - "In life, lots of people know what to do, but few people actually do what they know. Knowing is not enough! You must take action." PROACTIVITY - "The most important thing you can do to achieve your goals is to make sure that as soon as you set them, you immediately begin to create momentum." VISION - "The past does not equal the future." 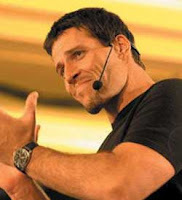 Apropos of nothing, I love Tony Robbins. I have a HUGE crush on the guy.